Originally uploaded by lil aNNa. The title is a fortune that G claims he got. I would fight him, but I one time got one with nothing in it. I don’t mean “No fortune in the cookie”. I mean, “No cookie. No fortune.” It was just a empty bag of air. I spent the rest of the day wondering if I was going to die of aphixiation. Anyway, while at Pei Wei this evening, G and I were discussing ways to approach the attractive girl at the counter. I suggested a fortune cookie with “Now’s the time to ask out that cute girl behind the counter.” But then I realized that there could be a really strong market for pickup lines in fortune cookies. Or even a short bio and the person’s phone numbers. 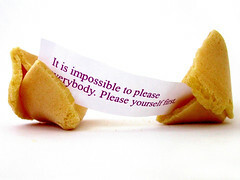 Think of it people: The Fortune Nookie. –Snoopykiss has been doing his homework. Not out of resolutions, but more out of revolutions, I’ve noticed changes in myself. All seem to be for the better. Pasts I’ve overcome. Demons I’ve pummeled into the ground and have resurfaced. New habits I’ve taken on. Heads I’ve shaven. But the one that’s interested me is in this current relationship with Kathy. And it is in this instance that I’ve grown, rather fallen into love here. Growing involves setting roots and feelings things out and going at a nature’s pace. Like the good Lord intended. Falling usually involves lots of exciting and crazy emotions, with your synapses firing more times than a redneck wedding. Until you stop falling. Then it hurts. Like a mothafuka. –Snoopykiss went to Ikea today and is thinking funny. We always view national tragedies in horror, but it rarely sinks in how gruesome they are until we see them first-hand. And it’s rarely pretty. 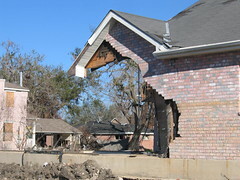 I got to see some of the damage done by Katrina during my visit back home to Cut Off. Thankfully, my home town was mostly spared, but the scene became completely different once we passed the levees that kept the water out. Going to Grand Isle was a sobering realization of how destructive Mother Nature can be when we ignore it. –Snoopykiss is sobered up. It’s time for New Years.